This simple organizer is similar to the Frayer model for vocabulary. 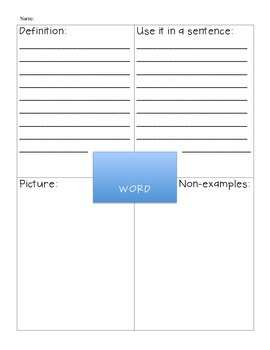 The page includes a spot in the middle for the student to write the word, lined boxes for the definition and a sentence with the word, and two empty boxes for a picture and non-examples. This product helps provide students with an opportunity to develop a thorough understanding of new vocabulary.